Summary:Sixteen-year-old Maggie Bennet’s life is in tatters. Her mother has disappeared, and is presumed dead. The next thing she knows, her father has dragged Maggie away from their elegant Newport home, off on some mad excursion to Yellowstone in Montana. Torn from the only life she’s ever known, away from her friends, from society, and verging on no prospects, Maggie is furious and devastated by her father’s betrayal. But when she arrives, she finds herself drawn to the frustratingly stubborn, handsome Tom Rowland, the son of a park geologist, and to the wild romantic beauty of Yellowstone itself. And as Tom and the promise of freedom capture Maggie’s heart, Maggie is forced to choose between who she is and who she wants to be. I’d love to enter. Thanks! I would love to be entered for this one. I would love to win this one. Thanks for the chance. I'm intrigued by this book, I'd be interested in reading it. Enter me, thanks so much! I've been dying to get a copy of this one! The cover of this is beautiful and it sounds really good! Enter me please. Thanks for this one. I love the cover! Old Faithful and romance? What more could a girl ask for? Sign me up for this one! Thank you! another good one! enter me please. Please enter meee ! Thank you ! 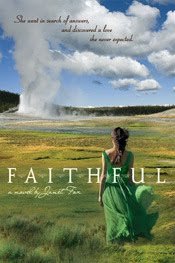 Historical novels are great, and I love the concept behind this one with Old Faithful.